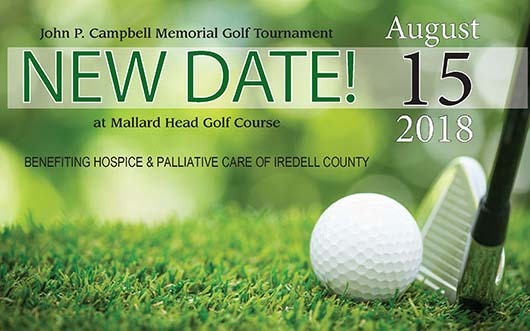 On August 15, two flights of golfers will tee off at Mallard Head Golf Course in Mooresville for the 24th Annual John P. Campbell Memorial Golf Tournament. This event is the longest-running fundraiser for Hospice & Palliative Care of Iredell County (HPCIC), and has raised more than $600,000 over the past 24 years. Iredell native John Campbell was a longtime supporter of hospice and the work HPCIC does in the community, and in 1995, he held the first tournament at Mallard Head to raise awareness and support for the organization. Campbell passed away in 2006, and his family has kept the tournament tradition alive and continued Campbell’s generous support of HPCIC. In 2017, the Campbell family added a raffle in memory of Sara Campbell, which supports a holiday gathering for HPCIC’s Rainbow Kidz Pediatric Grief Program. The tournament features two flights, with shotgun starts at 8 a.m. and 2 p.m. Entry is $75, with a two-person Captain’s Choice format for men’s and women’s divisions. Entry includes green and cart fees, hotdogs and hamburgers served all day, gifts and refreshments. The field is limited to the first 240 paid entries. For more information, call Eddie Campbell at 704 664-7031. With offices in Mooresville and Statesville, HPCIC is dedicated to providing extraordinary care to our patients, families and community. To learn more about HPCIC, visit www.hoic.org or call 704-873-4719.